Send flowers to show your mum just how much you love her! 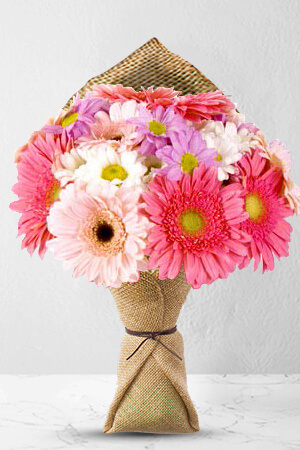 With pastel Gerberas and colourful Chrysanthemums this bouquet is colourful, bountiful and beautiful. Your mum deserves a bouquet like this every now and again.The vase in the picture is not included, however if you would like to make Mums Garden extra special, add a vase to your order. We recommend the Standard Vase. The web site was easy to use. Prices were clear and reasonable. Flowers are always lovely and delivered promptly. Thankyou. Easy to order. Good service. Good choice of flowers. Very happy with the product and delivery.